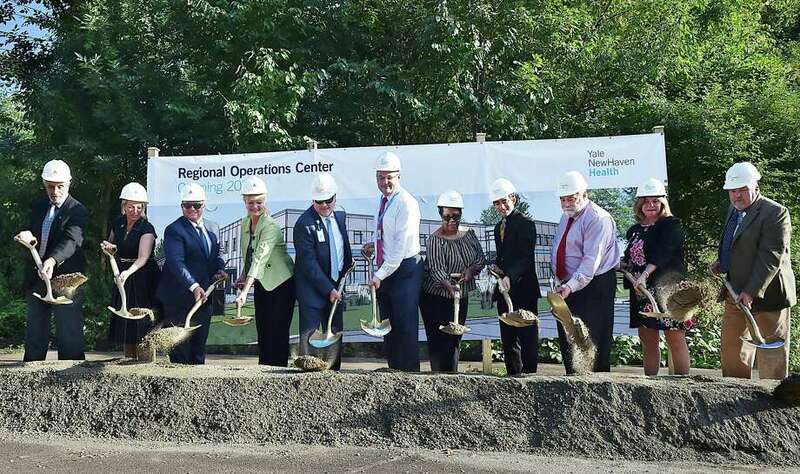 Yale New Haven Health breaks ground for new regional distribution center in West Haven. Video by Mark Zaretsky — New Haven Register. WEST HAVEN — Yale New Haven Health Service Corp. held the ceremonial ground breaking Wednesday evening for its new regional operations center on the 117-acre former Sursum Corda/Acorn Technology Campus property off Derby Avenue. But with acres of foundation now poured for the 140,000-square-foot building on former water company land near the Maltby Lakes — which will supply Yale New Haven facilities from Rhode Island to Westchester County, N.Y. — construction already is well underway. The goal is to have the center open by mid-summer 2019 — and there’s room for additional growth in the future, officials said. Mayor Nancy Rossi, City Council Chairman Ron Quagliani, D-At Large, three state reprentatives and a number of other city officials joined Yale New Haven Health officials for the celebration. “It’s a really exciting event. I think it marks ... a milestone in our development and systemization of who we are as a health system,” Yale New Haven Health Executive Vice President and Chief Operating Officer Christopher O’Connor told those gathered. He added later, “the neat thing is, this won’t be the last opportunity to talk about growth on this site,” he said. The regional operations center will be primarily a one-story building with a mezzanine, Yale New Haven said in a news release. It will be staffed by about 90-95 managers and staff, with half of those positions newly-created jobs. Yale New Haven will continue to use its Howard Avenue warehouse in the former SEAMCO building in New Haven. The new facility will serve as the future home of an advanced warehouse to distribute medical supplies throughout the Yale New Haven Health network. West Haven state Reps. Dorinda Borer, Michael DiMassa and Charles Ferraro, mayoral Executive Assistant Louis P. Esposito, Allingtown Interim Fire Chief Michael Esposito and city Commissioner of Planning & Development Fred E. Messore were among those on hand to turn a shovel or two of earth. In addition to O’Connor, Yale New Haven Health was represented by Vice President for Pharmacy and Supply Chain Services Lori Lee and Vice President for Facilities Design, Construction and Real Estate Stephen Carbery, among others. Lee said the new distribution will be more efficient and less costly than the system’s current way of storing, moving and supplies. “We’ll have a very large warehouse on the first floor,” Lee said. “It will have the ability of automation and bar coding and technology so that what we pick and send to our hospitals is safe and accurate for our patients, which is our mission. “We think that bringing together support services like pharmacy and info technology and materials management, clinical engineering” into one location is a better way of doing things, she said. It will give Yale New Haven Health “the ability to centralize all of these types of services that we now do across five hospitals and multiple clinics” to provide “the efficiency and the value for our patients,” Lee said. “A project of this magnitude is a significant undertaking,” said Borer, who said she looks forward to being at the dedication. “West Haven and Yale have a very long relationship that’s developed over the years, and the fact that a world class organization such as the Yale health system is expanding their footprint in West Haven ... is just a testament to how far that relationship has come,” she said. The building was designed by The SLAM Collaborative in Glastonbury, with the pharmacy component designed by Grifols, with mechanical and electrical engineering and plumbing work by Fitzemeyer & Tocci of Woburn, Mass. Yale New Haven’s distribution partner is Virginia-based Owens & Minor, which currently handles much of the system’s distribution from a warehouse in Franklin, Mass., said Carbery.